Foiled Dark Grey is a smooth finished look for a modern look. 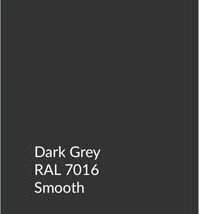 Manufacturer: Homeline RAL Colour: 7016 Product Length: 5m Product Width: 150mm Product Thickness: 9mm Return Leg: 38mm Accreditations: BSI Approved Guarantees:10 years Product Type: uPVC Smooth/Matte Dark Grey 9mm Reveal Liner Other: Available in a range of colours includ..
RAL Colour: 7016 Product Length: 5m Accreditations: BSI Approved Guarantees: 10 Years Product Type: uPVC Dark Grey Cladding U-Trim ..
RAL Colour: 7016 Product Length: 5m Product Width: 100mm Product Thickness: 9mm Return Leg: 38mm Accreditations: BSI Approved Guarantees: 10 years Product Type: uPVC Smooth/Matte Dark Grey 9mm Flat Board Other: Available in a range of colours including, Light Oak, White, Maho..
RAL Colour: 7016 Product Length: 5m Product Width: 150mm Product Thickness: 9mm Return Leg: 38mm Accreditations: BSI Approved Guarantees: 10 years Product Type: uPVC Smooth/Matte Dark Grey 9mm Flat Board Other: Available in a range of colours including, Light Oak, White, Maho..
RAL Colour: 7016 Product Length: 5m Product Width: 150mm Product Thickness: 9mm Return Leg: 38mm Accreditations: BSI Approved Guarantees: 10 years Product Type: uPVC Smooth/Matte Dark Grey 9mm Vented Flat Soffit Board Other: Available in a range of colours i..
RAL Colour: 7016 Product Length: 5m Product Width: 150mm Product Thickness: 16mm Return Leg: 38mm Accreditations: BSI Approved Guarantees: 10 years Product Type: uPVC Smooth/Matte Dark Grey 16mm Reveal Liner Other: Available in a range of colours including, Light Oak, White, ..
RAL Colour: 7016 Product Length: 5m Product Width: 175mm Product Thickness: 9mm Return Leg: 38mm Accreditations: BSI Approved Guarantees: 10 years Product Type: uPVC Smooth/Matte Dark Grey 9mm Reveal Liner Other: Available in a range of colours including, Light Oak, White, Ma..
RAL Colour: 7016 Product Length: 5m Product Width: 175mm Product Thickness: 9mm Return Leg: 38mm Accreditations: BSI Approved Guarantees: 10 years Product Type: uPVC Smooth/Matte Dark Grey 9mm Flat Board Other: Available in a range of colours including, Light Oak, White, Maho..
RAL Colour: 7016 Product Length: 5m Product Width: 175mm Product Thickness: 16mm Return Leg: 38mm Accreditations: BSI Approved Guarantees: 10 years Product Type: uPVC Smooth/Matte Dark Grey 16mm Reveal Liner Other: Available in a range of colours including, Light Oak, White, ..
RAL Colour: 7016 Product Length: 5m Product Width: 200mm Product Thickness: 9mm Return Leg: 38mm Accreditations: BSI Approved Guarantees: 10 years Product Type: uPVC Smooth/Matte Dark Grey 9mm Reveal Liner Other: Available in a range of colours including, Light Oak, White, Ma..
RAL Colour: 7016 Product Length: 5m Product Width: 200mm Product Thickness: 9mm Return Leg: 38mm Accreditations: BSI Approved Guarantees: 10 years Product Type: uPVC Smooth/Matte Dark Grey 9mm Flat Board Other: Available in a range of colours including, Light Oak, White, Maho..
RAL Colour: 7016 Product Length: 5m Product Width: 200mm Product Thickness: 16mm Return Leg: 38mm Accreditations: BSI Approved Guarantees: 10 years Product Type: uPVC Smooth/Matte Dark Grey 16mm Reveal Liner Other: Available in a range of colours including, Light Oak, White, ..
RAL Colour: 7016 Product Length: 5m Product Width: 225mm Product Thickness: 9mm Return Leg: 38mm Accreditations: BSI Approved Guarantees: 10 years Product Type: uPVC Smooth/Matte Dark Grey 9mm Reveal Liner Other: Available in a range of colours including, Light Oak, White, Ma..
RAL Colour: 7016 Product Length: 5m Product Width: 225mm Product Thickness: 9mm Return Leg: 38mm Accreditations: BSI Approved Guarantees: 10 years Product Type: uPVC Smooth/Matte Dark Grey 9mm Flat Board Other: Available in a range of colours including, Light Oak, White, Maho..
RAL Colour: 7016 Product Length: 5m Product Width: 225mm Product Thickness: 16mm Return Leg: 38mm Accreditations: BSI Approved Guarantees: 10 years Product Type: uPVC Smooth/Matte Dark Grey 9mm Reveal Liner Other: Available in a range of colours including, Light Oak, White, M..
RAL Colour: 7016 Product Length: 5m Product Width: 250mm Product Thickness: 9mm Return Leg: 38mm Accreditations: BSI Approved Guarantees: 10 years Product Type: uPVC Smooth/Matte Dark Grey 9mm Reveal Liner Other: Available in a range of colours including, Light Oak, White, Ma..
RAL Colour: 7016 Product Length: 5m Product Width: 250mm Product Thickness: 9mm Return Leg: 38mm Accreditations: BSI Approved Guarantees: 10 years Product Type: uPVC Smooth/Matte Dark Grey 9mm Flat Board Other: Available in a range of colours including, Light Oak, White, Maho..
RAL Colour: 7016 Product Length: 5m Product Width: 250mm Product Thickness: 16mm Return Leg: 38mm Accreditations: BSI Approved Guarantees: 10 years Product Type: uPVC Smooth/Matte Dark Grey 16mm Reveal Liner Other: Available in a range of colours including, Light Oa..
RAL Colour: 7016 Product Length: 5m Product Width: 300mm Product Thickness: 9mm Return Leg: 38mm Accreditations: BSI Approved Guarantees: 10 years Product Type: uPVC Smooth/Matte Dark Grey 9mm Reveal Liner Other: Available in a range of colours including, Light Oak, White, Ma..
RAL Colour: 7016 Product Length: 5m Product Width: 300mm Product Thickness: 9mm Return Leg: 38mm Accreditations: BSI Approved Guarantees: 10 years Product Type: uPVC Smooth/Matte Dark Grey 9mm Flat Board Other: Available in a range of colours including, Light Oak, White, Maho..
RAL Colour: 7016 Product Length: 5m Product Width: 400mm Product Thickness: 16mm Return Leg: 38mm Accreditations: BSI Approved Guarantees: 10 years Product Type: uPVC Smooth/Matte Dark Grey 16mm Reveal Liner Other: Available in a range of colours including, Light Oak, White, ..
RAL Colour: 7016 Product Length: 5m Product Width: 400mm Product Thickness: 9mm Return Leg: 38mm Accreditations: BSI Approved Guarantees:10 years Product Type: uPVC Smooth/Matte Dark Grey 9mm Reveal Liner Other: Available in a range of colours including, Light Oak, White, Mah..
RAL Colour: 7016 Product Length: 5m Product Width: 400mm Product Thickness: 9mm Return Leg: 38mm Accreditations: BSI Approved Guarantees: 10 years Product Type: uPVC Smooth/Matte Dark Grey 9mm Flat Board Other: Available in a range of colours including, Light Oak, White, Maho..
RAL Colour: 7016 Product Length: 5m Product Width: 300mm Product Thickness: 9mm Accreditations: BSI Approved Guarantees: 10 years Product Type: uPVC 9mm Dark Grey Hollow Soffit Other: Available in a range of colours including, Light Oak, White, Black Ash, Rosewood, Irish Oak, Sl..
RAL Colour: 7016 Product Length: 5m Product Width: 405mm Product Thickness: 16mm Return Leg: 38mm Accreditations: BSI Approved Guarantees:10 years Product Type: uPVC Smooth/Matte Dark Grey 16mm Reveal Liner Other: Available in a range of colours including, Light Oak, White, M..
RAL Colour: 7016 Product Length: 5m Product Width: 12mm Accreditations: BSI Approved Guarantees: 10 Years Product Type: uPVC Dark Grey Quadrant Trim ..
RAL Colour: 7016 Product Length: 5m Product Width: 19mm Accreditations: BSI Approved Guarantees: 10 Years Product Type: uPVC Dark Grey Quadrant Trim .. Product Length: 5m Product Dimension: 25mm Accreditations: BSI Approved Guarantees: 10 years Product Type: uPVC Dark Grey D-Section .. 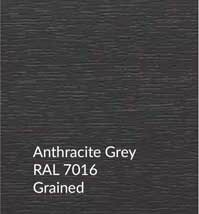 Product Length: 5m Product Width: 20mm Product Thickness: 6mm Accreditations: BSI Approved Guarantees: 10 years Product Type: uPVC 20mm Dark Grey RAL 7016 Edge Fillet Trim .. Dark Grey angle for external use. 50mm by 50mm. Comes in 5 metre lengths. .. Product Length: 5m Product Width: 40mm Product Thickness: 6mm Accreditations: BSI Approved Guarantees: 10 years Product Type: uPVC 6mm Grey Architrave .. 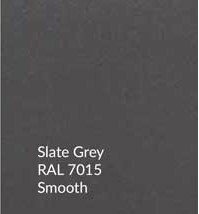 Product Length: 5m Product Width: 60mm Product Thickness: 6mm Accreditations: BSI Approved Guarantees: 10 years Product Type: uPVC 6mm Dark Grey Architrave .. Product Length: 5m Product Width: 90mm Product Thickness: 6mm Accreditations: BSI Approved Guarantees: 10 years Product Type: uPVC 6mm Dark Grey Architrave .. Product Length: 500mm Product Width: 50mm x 50mm Accreditations: BSI Approved Guarantees: 10 years Product Type: uPVC 500mm Dark Grey Square Internal Double Ended Fascia Joint .. 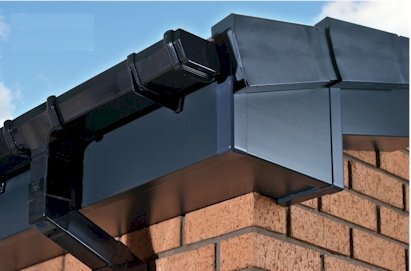 Product Length: 500mm Product Width: 50mm x 50mm Accreditations: BSI Approved Guarantees: 10 years Product Type: uPVC Dark Grey External Square Fascia Double Ended Corner ..